And what about the box? On one side of my family runs a genetic condition known as Retinitis Pigmentosa — this is essentially a condition that causes your eyesight to deteriorate over time. Often, this makes me think about how the technology that we create could actually make a difference to someones life and how we, as creators, could be a part of that. Because of this, a few years ago (using an Arduino Uno) I created a refreshable braille display that essentially took a text file and displayed the contents in the form of braille. Now that Android Things is available and I had picked up a kit from pimoroni, I decided to revisit this project and take it up a notch to create BrailleBox. In this article we’ll be looking at what BrailleBox is, how it was constructed and the little amount of code that it took to create it. When I originally built the first edition of this with the Arduino Uno, it involved loading a text file into the program which was quite a manual process — this wasn’t very ‘smart’ (hey, it was only a prototype!). With the Internet of Things, you expect a device to be a bit ‘smarter’ than this — so it was obvious that the the approach this time around needed to be automated, or somewhat less-manual. Should the device fetch the news automatically? This is automated, but I might not be at the device when it displays the article. This could also be quite alerting for the user if the device randomly starts clicking out of the blue. You can see here that each letter and each number is represented by its own unique representation of braille ‘points’. With this in mind, it’s actually quite a simple system (probably not so simple to learn however) — from this system we can create complete word representations by piecing together combinations of letter representations. Once we have these ‘words’, we then need some way of displaying them in the physical world. But how can we recreate this in the physical world? Current solutions have been pretty expensive — dynamic braille displays are nothing new, except they cost thousands of pounds to build and purchase. The whole point of this project originally was to be able to do it for a fraction of the price, making this kind of technology accessible to many (that’s one of the things I love about Android after all). But how do these braille points get shown when it comes to BrailleBox? Well, in relation to the Android Things platform, we have access to what’s known as GPIO (General Purpose Input Output), we’ll come onto this more later in the article — but if you look at the image on the left, you’ll notice that we can arrange the output of these pins to look very similar to the braille sequences above. I decided the little plastic hook wasn’t very user friendly for hands, so I pulled them off and fixed some little wooden balls to the end. But back to the point… this little metal rod will be pulled into the solenoid when a current is passed in, and pushed back up by the help of the spring when the current is released. This action allows us to ‘show and hide’ braille points, popping them out of the enclosure and making the only ‘touchable’ braille points the ones that make up the sequence of the letter that we’re currently displaying. Looks cool! How did you make it? I’m no expert in electronic engineering, but nothing has caught on fire yet so I think it’s doing good enough for a prototype so far 😅 It’s probably quite overwhelming to look at, so let’s break down each of the parts and what they’re doing. This connection shows the grounding of our solenoid to a grounding point on our breadboard. Here, this connection is coming directly from a GPIO pin on the raspberry pi. So whenever we send a signal using that GPIO pin, this is the entry point for the communication with the solenoid. Here I’ve placed a resistor to limit the current in the circuit, this is just for safety measures. It also conveniently prevents the solenoid from being pulled down so strongly, this reduces the ‘click’ sound which usually occurs without this resistance. Now that our current has gone through the resistor and diode within our circuit, we can route it to the solenoid to give it power, pulling the solenoid ‘down’ into a retracted state. This connection shows the grounding of our switch to a grounding point on our breadboard. This is the connection that routes back to our GPIO — this is how we send the signal that the button was pressed. This connection is routed to a point of power on our breadboard. Here I’ve placed a resistor to limit the current in the circuit, this is just for safety measures in regards to the circuit. Finally, this is the connection for the positive connection point of the switch. To send a signal to each of the required Solenoids when we wish to display a letter using the Braille pins. In the diagram below we use GIPO pins 17, 27, 22, 23, 24 and 25 for this. To receive a signal when the push button is pressed so that we know when to fetch a new article from the api. In the diagram below we use GIPO pin 6 for this. And what about the box?! I began by measuring a drilled 6 holes into the project box. Be sure to leave enough space on all 4 sides of the solenoids so that the other solenoids can fit in place comfortably. You can use a countersink drill head to smoothen our your holes, they look a lot cleaner and smoother if you do decide to do this 🙂 I also drilled a hole for the push button (this was a little bit bigger than the solenoid holes) and also one to feed out the wires for the solenoids. Next, you need to align each of the solenoids up with their corresponding hole. When doing this, you also need to ensure that the solenoid heads (the wooden balls) both pop-out of the hole enough and also fall-back in deep enough when operating. To get the right height it was a bit fiddly — to do this I ended up using a flat 4x4 lego piece as the base (I had to sand off the lego circle heads 😅) but these worked a treat! Now they were at the right height, I used some ‘No More Nails’ that I found in the shed to stick these in place. And voila! Other than screwing the base onto the project box, that was pretty much it! It wasn’t much work at all to put this little box together and it made the project feel a lot more complete than just being a bunch of components hanging off a breadboard. To begin with, you’ll need to add the dependancy for the Android Things support library to your project. This gives you access to Android Things related APIs that aren’t a part of the standard Android SDK. After creating the activity that will be used for the home activity, you’ll need to declare this as the launcher activity for the android things project. This means that when the device is booted, this activity will be launched by default. We previously looked at the solenoid components and GPIO that I used to display braille characters. 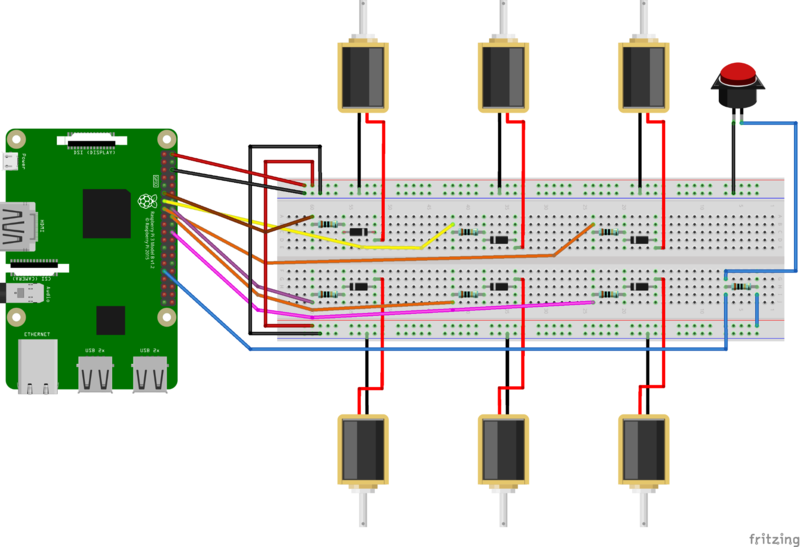 In order to use these GPIO ports, we need to configure them for use. In BrailleBox we do this when launching the application — we begin by open the GPIO pins using the pin numbers for the raspberry pi — we keep the numbers for these in the BoardDefaults class so that if we’re using another board it’s easy to switch these around. Note: When it comes to GPIO pins, the reference for the pin you are wishing to communicate with depends on the hardware board that you’re using. It’s good practice to create a BoardDefaults class so that you’re able to easily support different board types. For BrailleBox I’ve only filled in the GPIO pin ids for the Raspberry pi 3 as that’s all I have access to, but it will be simple to extend on this in future. If you look in the GpioHelper class, you’ll see that there’s a openSolenoidGpioPins() method that is used to configure the pins and store them in a List so that we can access them as and when we need. At this point out GPIO pins are all configured and ready to use when we wish to set values to them. But before we can do any of that we need to fetch an article from the api. When we receive a response back, we have an instance of a news article that we need to display in braille. When we have this instance, we take the title and description of the article and map it to it’s braille representation using a BrailleMapper class. This class essentially takes a given string and converts it to list of Braille representations that we can return and display on our solenoids. Then once we have a complete set of Braille representations for our given strings, we pass each one (with a delay using Observable.interval()) back to our activity. When we receive back a Braille representation, we loop through the solenoids and set each corresponding GPIO pin to the corresponding GPIO value. This allows us to recreate the representation for letters in braille using the solenoids to do so. So whilst we’re storing each representation as its true braille value (e.g. “100000" for ‘a’), the solenoids that I’m using (because they’re cheaper 😄) are sticking up (low current) by default, you basically use a current to give them a HIGH value which then pops the solenoid down. Because of this, we need to flip the real braille representation so that the solenoids I’m using can display it correctly. So ‘a’ would go from “100000” to “011111” and ‘b’ would go from “101000” to “010111” and so on. You can get solenoids that have a default state of starting ‘down’ and using a current to pop them up, but for a prototype it didn’t make too much sense to spend the extra money. And that’s pretty much it in terms of showing the braille representations of strings using the solenoid components. Other than that, a Button listener is used to detect when the push button is pressed (to fetch a news article) and I reset the solenoids every time a news article is requested. Once added, we can simply configure the GPIO pin (similar to how we did with our solenoids) so that we are able to listen for button presses within our application. In line 3 above, you’ll note that we create a new Button instance by retrieving the Button GPIO pin from our BoardDefaults class, as well as passing in the state for which the Button is classed as pressed. Whilst this is currently just a prototype it does what it needs to do, it’s not the prettiest looking thing but remember you shouldn’t judge a book by its cover ❤️ (that’s my excuse anyway).